New diagnostic functionality for maximizing productivity in the plant. The new 289 is the next generation high performance industrial logging multimeter designed to solve complex problems in electronics, plant automation, power distribution and electro-mechanical equipment. With the ability to log data and review it graphically on-screen, you can solve problems faster and help minimize downtime. Let the new 289 be your watchdog for systems or processes while you are off solving other problems. Maximize productivity with the combined Fluke 289 and FlukeView forms combo kit. With built-in data logger and TrendCapture capability, the 289 helps you track down elusive, intermittent problems, monitoring equipment with any of its functions while you do other jobs. Overlay your logged data from six meters or six time periods to find cause and effect relationships or for condition monitoring applications in FVF software. Turn your data into meaningful graphs and tables for a professional report. The 289/FVF combo kit gives a practical & affordable approach to predictive maintenance. • Low Pass Filter for accurate voltage and frequency measurements on adjustable speed motor drives and other electrically noisy equipment. • 50 ohm range – useful for measuring and comparing differences in motor winding resistance, low ohm measurements, or other contact resistance. • Two terminal 50 ohm range with 1 milliohm resolution, 10 mA source current. 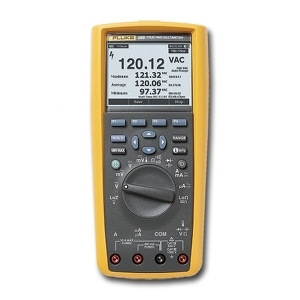 • True-rms ac voltage and current for accurate measurements on complex signals or non-linear loads.